Journal – 19th May, 1536. Today I witnessed an execution. My Husband insisted I accompany him saying it was a great honour and my duty as a wife, so this cold May morning I stood not 20 feet from the scaffold where the anointed Queen of England was shortly to die. There were a great number of persons present, many more than I expected, yet there was little noise. I scanned the faces of the crowd. I saw sadness, excitement, and even fear, but in every face I saw shame. I too felt ashamed and I shivered beneath my fur lined cape. Suddenly my Husband gripped my arm. “It is time” he whispered, and I could hear the steady sound of approaching drums. All eyes looked towards the Coldharbour Gate as the first of the King’s Guard appeared and began to line the route to the scaffold. An audible gasp could be heard as the Queen came into view. 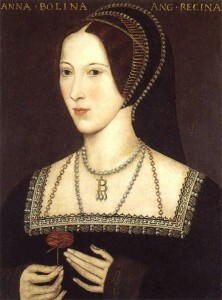 She wore a plain black damask gown, and a sumptuous ermine trimmed cape with crimson lining. She walked with such grace and calmness that she appeared to almost float towards the scaffold. I was transfixed, hardly daring to breathe for fear it would be heard above the silence that had fallen. As the Queen reached the scaffold steps she paused and turned to comfort the four Ladies waiting upon her. If I had not known better I would have thought it they who were about to lose their heads and the Queen but an observer, so great was their lamenting. The Queen mounted the scaffold and spoke briefly to one of the men. “That’s the Executioner of Calais” said my Husband. The Queen turned, placed both hands on the side of the scaffold, and smiled at the assembled crowd. “Good Christian people….” I could hear sobbing close by, indeed I was one of those who lost their composure in the face of such bravery. For here was a woman clearly not afraid to be judged by God, and by showing herself thus had stated that her conscience was clear without needing to speak it plainly. The Queen’s Ladies came forward and removed her cape and jewels, the Queen having to remove her own hood as her Ladies were shaking so badly. I gripped my Husband’s arm tightly, afraid that my legs would give way as the Queen knelt in the straw. Then a strange thing happened, one by one the crowd sank to their knees, even my Husband knelt, and I was thankful for the opportunity to do likewise. I glanced upwards, saw a flash of steel and that beautiful head disappeared from sight. There was so much blood! The Queen’s Ladies were kneeling in it whilst wrapping her body in a white sheet. My husband dragged me up by my arm and moved me forward and away. “It is over” he said.